Christine DeMerchant King Costume Page. King costume worn here without jewels. I usually have big flashy rings and a few necklaces. One of my favourite costume. The coat is appliqué with mostly lame and velvets. The base coat is quite heavy and this gives it great body and dignity. Most of the fabrics were from dumpster diving in the garment district. 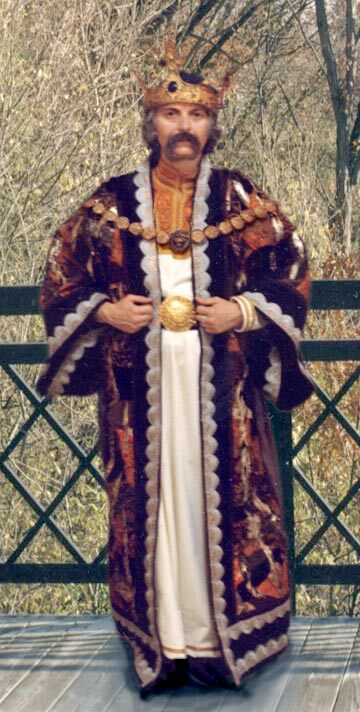 The under gown is cotton with gold fabric. I have also a satin gown that is richer looking. The accessories is what make this costume. Nothing says KING like a crown. 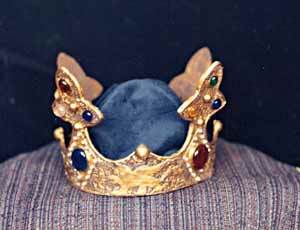 The crown is a papier mache base covered in textured fabric. White glue makes it quite flexible. Extra texture is hot glue The whole thing was painted gold and antiqued with acrylic brown paint. The jewels are mostly glass cabs hot glued on. Book about making wonderful glittery crowns and tiaras. The necklace is moulded from hot glue in wet plaster of paris mould. The belt is from Goodwill. The moustache is made from my own hair. I actually used real wig-making lace and wove the piece. It looks real. I attended a Halloween event in this costume and when I went to the loo the woman who was in already tried to shoo me out! I actually had a very pretty girl try to hit on me!